And so we all entered the golden age of French Napoleonic decadence. 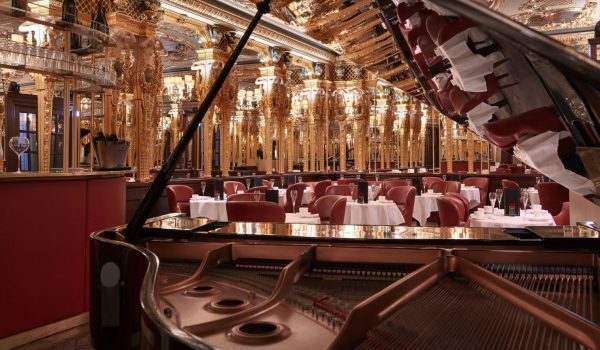 Golden walls, Louis XVI interior design, ceiling fresco, a grand piano for headline cabaret acts and a DJ for the late night guests which include A-list celebrities such as Mick Jagger, David Bowie, Eva Herzigova, TV stars, supermodels and fashionistas alike. I came to the Oscar Wilde Bar at Hotel Café Royal l to dine with my fellow writers, artists, and models. 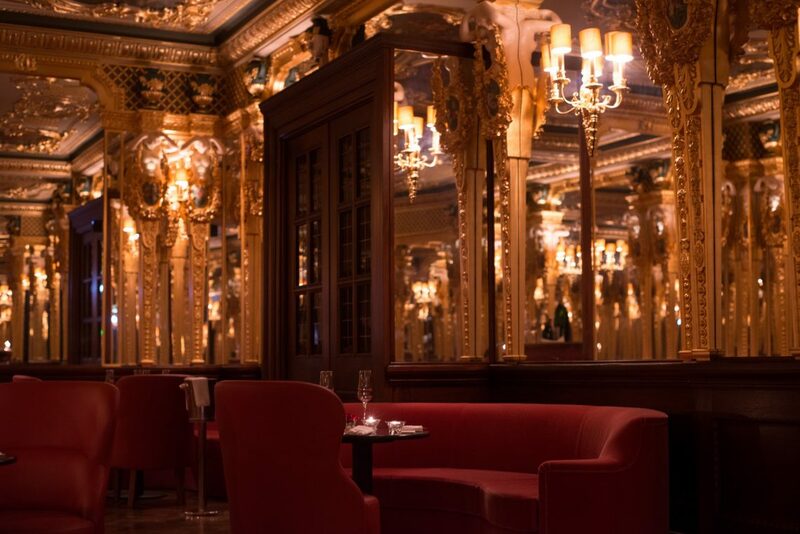 Located in central London, in the heart of Piccadilly on Upper Regent Street, Cafe Royal Hotel’s Oscar Wilde Bar is a welcome escape from the hustle and bustle and a private secluded dining room with a touch of magic. The atmosphere is buzzy and the food delicious. I bumped into the male cover model of Ralph Lauren who was seated with a famous supermodel (not to be disclosed) as well as some surprising socialites. With a private feel and a capacity of only 85 people, I would definitely LOVE to take over the whole place for a neo-classical, Louis XVI sit down candlelit dinner with silver candelabra, violinists and English National Ballet dancers in Black Swan costumes pirouetting against the gilded backdrop… if I had the right occasion to do so. We had a selection of sharing platters which included fresh lobster, tuna and salmon tartar, a hot and cold selection of meats, dips and hot baked bread. There is an extensive wine list and a selection of ice cold bottles of champagne. 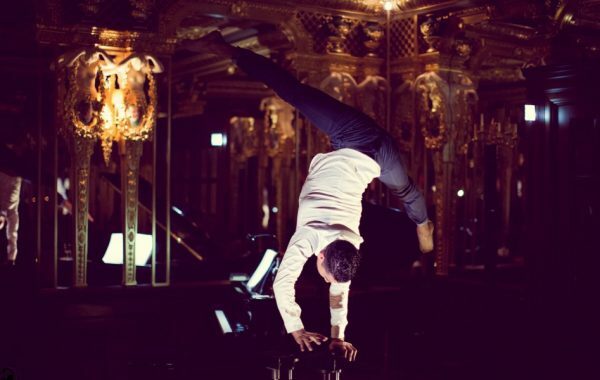 It is a hidden gem for those wanting some live music in the form of the Black Cat Cabaret (Salon Des Artistes) with enchanting jazz singers, pianists, and performers. 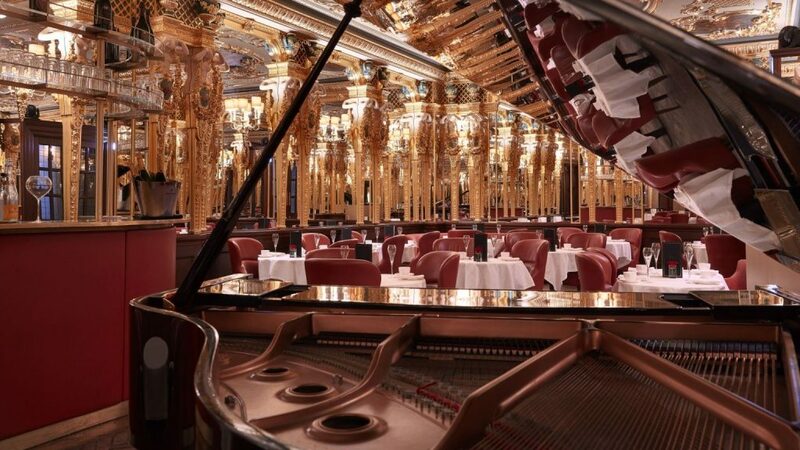 The Oscar Wilde Bar at Hotel Café Royal is open from 6pm till 3am Tuesday to Saturday and has a regular programme of live entertainment on select evenings, including the flagship cabaret show on Friday and Saturday nights. Reservations are recommended after 9pm so why not book yourself a table and swing by? You know you want to.